Peace Officers are taking the need to feed in Chestermere seriously. 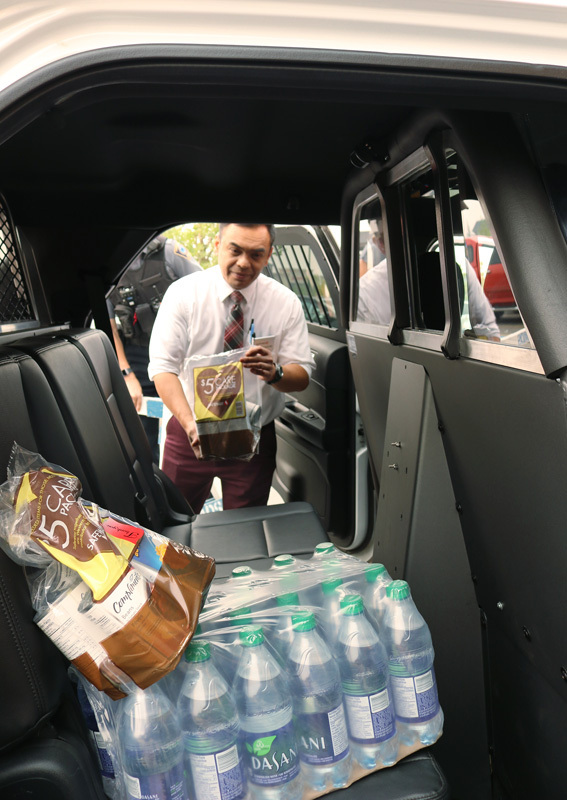 On Aug. 18 city firefighters were stranded on top of the Safeway, and the only way down was by resident’s food bank donations to Pack the Patrol Car. “We’re doing this, so we can help bring the community together in a special way,” said Event Coordinator and Level 1 Community Peace Officer Shawn Press. “Right now, we’re doing Pack the Patrol Car in support of the food bank,” Press added, all non-perishable food item donations, and any proceeds raised will go directly to the food bank. 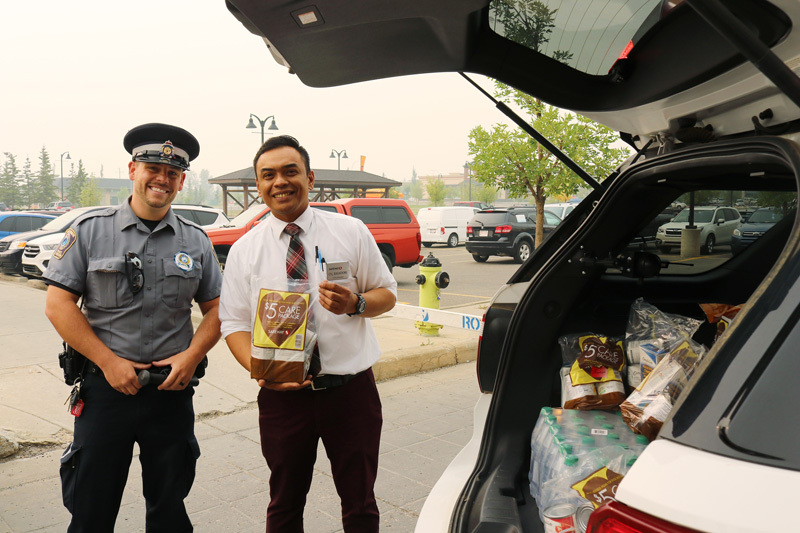 Pack the Patrol Car will help support the Chestermere Regional Food Bank programs such as, breakfast programs, and food hamper programs, Press said. Press has seen an increased need in supporting the food bank, he added, programs such as the Chestermere Back Pack Program had an extremely limited amount of food, and at one point ran out of food earlier this summer. Press said one concern while Packing the Patrol Car was the weather, and recent smoke overall throughout the province. However, firefighters still went onto the roof of the Safeway for charity. 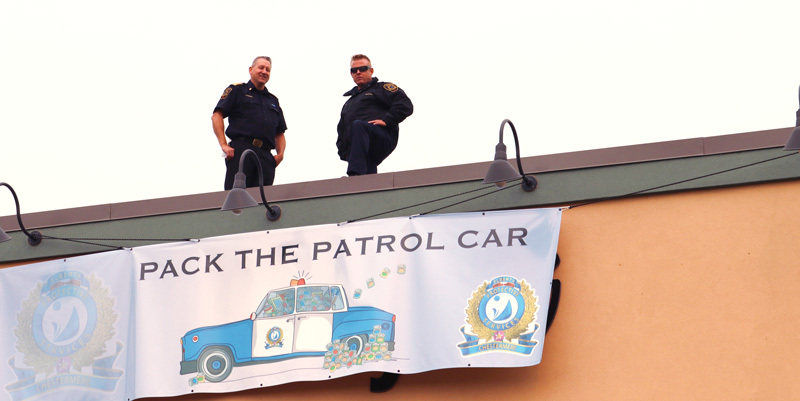 Press’s goal was to fill one of the peace officer’s patrol cars in order to get the firefighters down from the roof, while having positive impact, engaging the community and bringing some people out to have fun on a Saturday afternoon. He added, “If I had it my way and it was perfect, I would fill the whole trailer up. Chestermere Food Bank Volunteer of three years Anne Madge said the involvement from the community, and everyone giving back is what makes Chestermere such a caring community to live in.